We were contacted by a leading aerospace manufacturer to help with a large data migration project. This is a global manufacturer of electronic instruments and electromechanical devices with 15,000 employees, 150 locations worldwide in 30 countries, and sales of over $4B! So, yes, when they said “large data migration project”, they meant it! After visiting their local offices in the US to assess the total scope of the project, we set up a dedicated team to help them out, consistent with our typical engagement model. Also, typical of the way we work, we first understood and documented their design/modeling standards and best practices. This step, although time consuming and deliberate, was very essential to the overall success of the project and helped set a benchmark to judge the quality of our deliverables and ensure they meet the customer’s internal standards. Most services companies would have no choice but to manually remaster all the data from one CAD system to another. Needless to say, this adds time (and $$) to the project. Our years of experience in developing data migration software provided us with a huge competitive advantage when dealing with a data migration initiative of this magnitude. We were able to use an optimum mix of our proprietary data migration software and expert services to migrate the data in 80% less time than it would have taken if we (or anyone else for that matter) were to do this manually. Now stop and read that last sentence again. Yes, that wasn’t a typo. I did say 80%! Of course, at times manual intervention was required, especially when dealing with fully parametric data exchange, but the time (and cost) savings resulting from use of our proprietary tools were unmatched. The entire project was managed using our (yes, again!) proprietary work order management software, PowerLink. PowerLink eliminated the need to exchange data over emails or ftp and instead to use a browser-based system to schedule, prioritize and monitor the entire project 24X7 so that all stakeholders were apprised at all times regarding the progress. No more “I didn’t get your email, it must’ve gone to my spam folder!” excuses. In the end, we were able to successfully complete the data migration initiative. 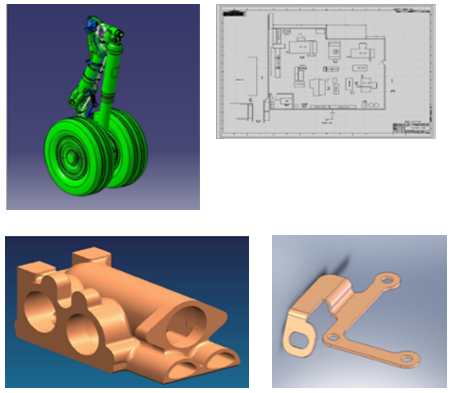 The success of this project was not only the result of an experienced group of engineers and CAD designers, but also largely in part because of the use of our proprietary tools that saved the customer significant $$ and PowerLink that helped the customer have complete visibility into the progress of the project.